GEI Luncheon in honor of Amb. Gian Lorenzo Cornado, Italian Ambassador to Canada – New York, May 17, 2013 – Remarks by Lucio Caputo, President of GEI. Good afternoon, ladies and gentlemen. Today I am very pleased to welcome to GEI the new Italian Ambassador to Canada, the Honorable Gian Lorenzo Cornado. Prior taking this important job, he covered different significant positions for the Italian Ministry of Foreign Affairs, which he joined right after receiving his degree in Political Science at “LUISS University” in Rome in 1984. From 1985 to 1987 Ambassador Cornado was the Head of the Department of Social Affairs of the Ministry of Foreign Affairs in Rome. Then he left this position to move to Ottawa where he held the role of First Secretary at the Embassy of Italy until 1992. In the next two years he was Consul of Italy in Toulouse. He returned to Rome in 1994 and until 1997 he assumed the position as Department Head of Human Resources of the Ministry of Foreign Affairs. Gian Lorenzo Cornado returned to North America in 1997 as Counselor at the Permanent Mission of Italy to the United Nations in New York until 2000. Then from 2000 to 2004 he moved to Montreal where he was Consul General of Italy and Permanent Representative of Italy to the International Civil Aviation Organization. In 2004 he returned, once again, to Rome and for one year served as Deputy Chief of the Secretary General’s office of the Ministry of Foreign Affairs; in the following two years he was Diplomatic Advisor to the Minister of Justice. In 2009 the Honorable Cornado was named Deputy Permanent Representative of Italy to the United Nations in New York. The next year he remained in the United States covering the role of Deputy Chief of Mission at the Embassy of Italy in Washington. Three years later in 2012 he assumed the role of Chief of Staff to the Minister of Foreign Affairs in Rome. I have had the fortunate opportunity to have known Gian Lorenzo for some time now. I can definitely say that he is a person of integrity, intelligence and dedication. He will be a great leader and, without a doubt, an outstanding Ambassador. 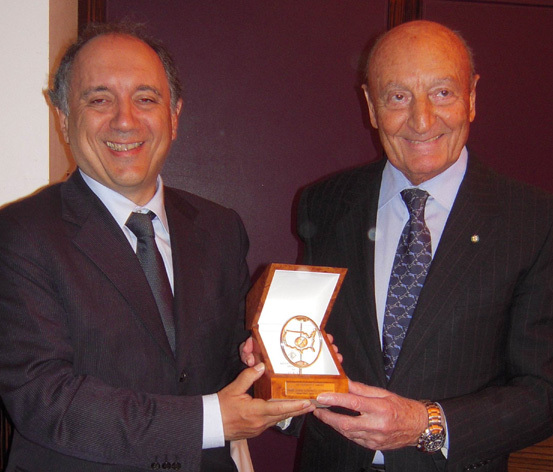 Therefore, I am pleased to welcome Ambassador Gian Lorenzo Cornado and present him on behalf of GEI with the the “GEI FRIENDSHIP AWARD” in honor of his many achievements. The luncheon was held on May 17, 2013 in the Stella Private Room of Le Cirque restaurant in New York City.